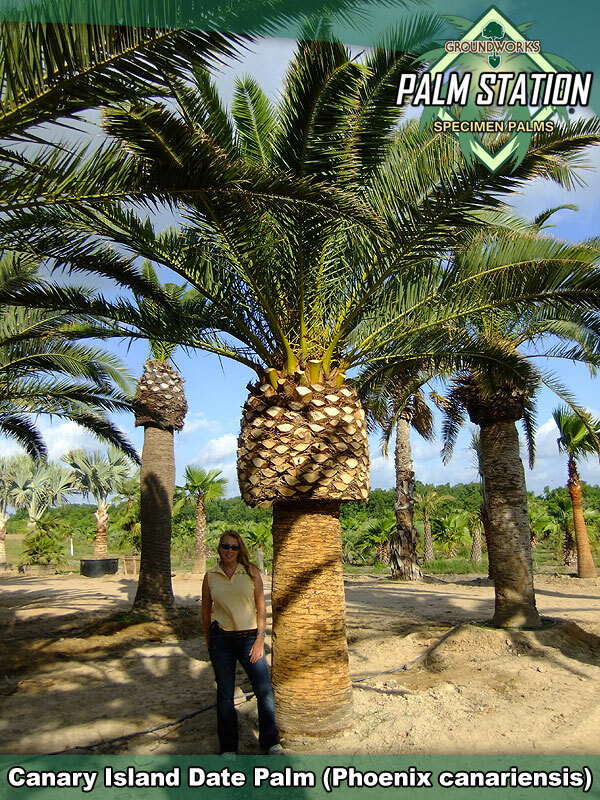 We have a large selection of Canary Island Date Palms in stock at our Boynton Beach Florida and Houston Texas facilities. Highly prized for their elegant beauty Canary Island Date Palms are so beautiful and alluring that you can use them just about anywhere on site! Thick heavy caliper trunk with large nut at the top. Dark green foliage, huge canopy. Available in matching sizes from 6' to 25' of clear trunk. Groundworks has in stock, ready for immediate pick up, the largest selection of P. Canariensis in the Southeastern United States. Phoenix Canariensis has been utilized as a theme generating focal point in landscapes worldwide for decades. 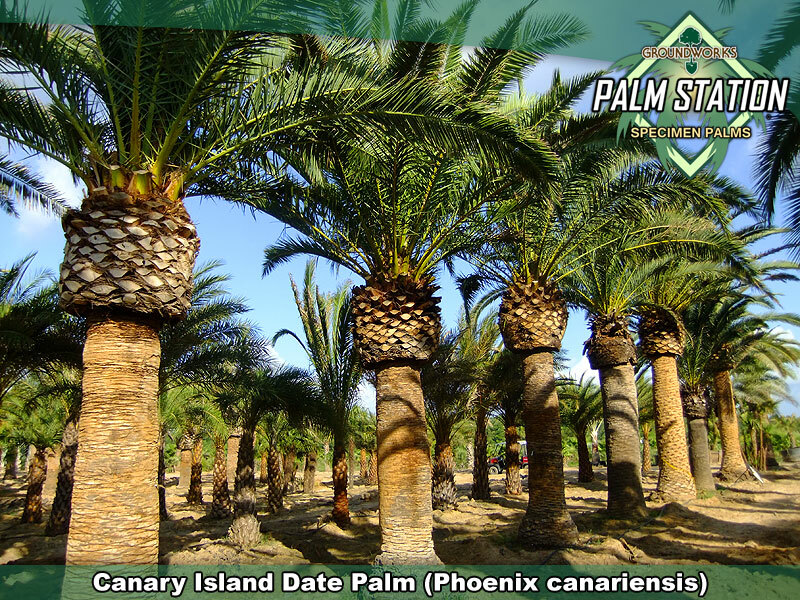 Its majesty and substantial presence make the Canary Island Date Palm a powerful choice where you a looking to bring natural maturity to a site. Utilized in rows or as a freestanding centerpiece, there really aren't many locations on site where you cannot use Canariensis successfully. Probably the best adjective that one could use to describe Canariensis is Stunning. If you get through the establishment period sane, and provided you maintain it with reasonable diligence, your Canary will probably outlive you and will be a truly stunning addition to the family. Mature Canary Island Date Palms are rarely found in nurseries. These unique specimens are collected from existing landscapes throughout the warmer regions of the United States. Because they are collected palms, obtaining exactly matching Canaries is not a realistic goal. We can come fairly close but for applications where an exact match is a necessity, you may want to consider changing the spec to either the Medjool or the Zahidi Date Palm. Medjools and Zahidis are nursery produced and so can be matched far more closely. Mature Canariensis are often decades & decades old when transplanted for resale. Because of the time frame necessary to reach these larger sizes, this inventory just isn't available in traditional nursery settings. The palms are field located from existing landscapes and then resold for use in new landscape designs. Many companies that sell these majestic palms harvest them from the ground they grew in for all those years and then deliver them directly to a new site. This method is far less expensive for the supplier to undertake than the harvesting & nurturing regimens that our inventories undergo. This kind of "direct delivery" supplier does not have any losses, no costs associated to holding and caring for the inventory and no costs associated to the many risks of transplant; all of those cost variables are passed to the client. We love the palms far too much to operate in this fashion. The commitment we make requires that we harvest the palms and then hold them in one of our secure nurturing areas for many months. All totaled we have more than 200 mature Canariensis undergoing various stages of nurturing on any given day and we provide targeted intensive care during the initial shock period working continuously to reestablish a healthy new root system. Once the initial move has been successfully accomplished, the palms can be more safely relocated onto a customer's site where a reasonable degree of care will engender prompt establishment. When you purchase a Canary Island Date palm from Groundworks, every possible precaution has been taken, the finest professional care in the industry has been rendered and the palms are well prepared for transplant into their new homes. Where losses on site do occur, your Groundworks one year limited warranty will insure that the palm is promptly replaced. No nonsense, no crying. If you are a lover of mature palms and are thinking "Canary", you have come to the right place. We invite you to come by and visit us in Boynton Beach Florida or Houston (Alvin) Texas. 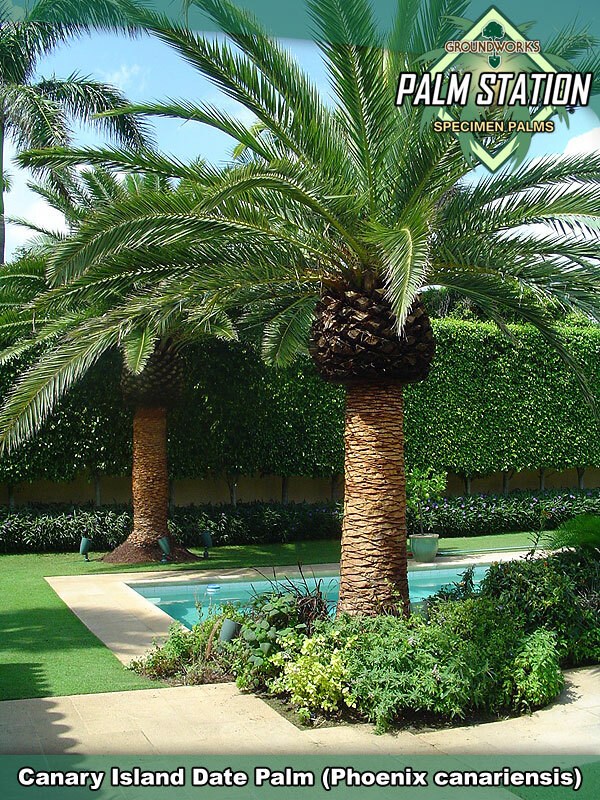 We will show you a collection of specimen palms that is unrivaled anywhere in the Southern United States. We are confident that the perfect palm for you is here right now and we would be pleased to make the introduction. Dense heavy canopies of green to dark green fronds with a thick, pineapple like nut comprised of cut frond stems just under the fronds. Very heavy caliper trunk, usually 28 inches plus. Trunks are semi smooth and display a distinct diamond shape pattern. Aerial roots are often found on the lower two feet of trunk. Canary Island Dates have been known to reach heights of 60 feet of clear trunk but they are very, very slow growers. Groundworks stocks a large selection of Phoenix Canariensis at our Boynton Beach Florida and Houston Texas facilities. Because these majestic beauties are collected from residential neighborhoods all over Florida and the Southwest, we really cannot "order" specific sizes. The best that we can do is to locate them, buy them in, stock them and then make them available for your review and selection. If you have a need for matching palms that are not in holding we can help you but need time to do our job so advance notice is a must. Please contact a sales rep for more information on advance notice requirements.